Tinplate Dad here. Railroad equipment offers an unlimited resource of potential tinplate projects. 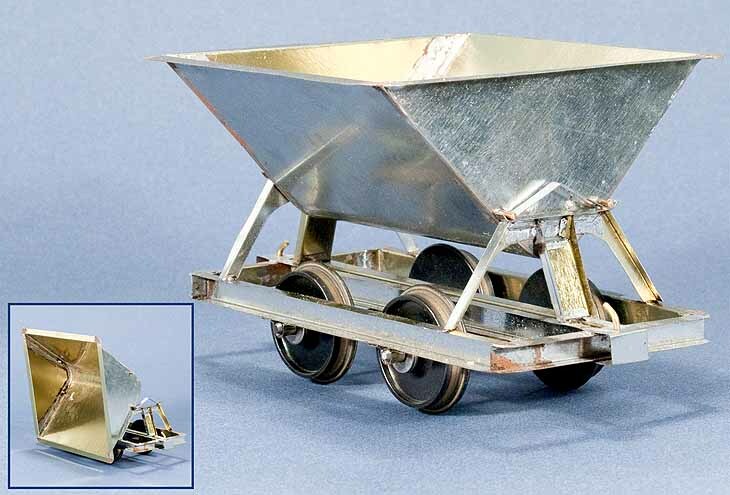 Here I’ve done a side-dump ore car, also called a tipper car, in 7/8″ scale for gauge-1 track. These were used by mining companies and contractors all over the world. This is not a model of any specific car but is typical of many. This is a fairly involved project but no single part is particularly difficult. If you’ve been through some of our easier projects, you should have no difficulty with this one. Tinplate Girl will show you how to build it.